Updated my previous article on using svn+ssh with DreamWeaver with a solution. Adobe DW subversion guides – please don’t forget deletion! Wishing those at Adobe writing about DreamWeaver’s wonderful subversion integration would not keep omitting Deletion. Perhaps it is because deletion is not implemented in any automated sense (link) in DreamWeaver’s subversion client and the only sensible way to manage deletions or indeed renames (which as far as subversion is concerned is delete old file and add new file) is to use a 3rd party client. In my opinion this is all the more reason to mention this in articles like that in December’s EDGE “A guide to Subversion integration in Adobe Dreamweaver CS4”. Failing to provide notes on file deletions and file renames is going to leave newbie subversion users in a bit of a mess, with old files hanging around, or being restored when not expected following a revert. My earlier notes related: Dreamweaver CS4, Subversion and site Synchronize. Two cautions. Posted in Adobe, DreamWeaver, subversion comment on Adobe DW subversion guides – please don’t forget deletion! Dreamweaver CS4, Subversion and site Synchronize. Two cautions. The following notes assume three file sets: A: the remote site; B: The local site; C: The repository. We are linked to the repository using the SVN+SSH method I discussed yesterday. In this particular site, I have a folder within which server-side code generates and deletes server-side text files and modifications to MS Access databases. It is therefore necessary to sync from the server to the local copy. This is done using the settings: Get newer files from remote, and delete local files not on remote server. As in the following dialogue. However in my particular site my preview list of files appeared as follows. Can you spot what’s wrong?! By linking your local site to a subversion repository, you make that local site folder a working copy. This creates a host of hidden files within your local site folder which are used to coordinate synchronisation with the repository. These files should only ever be touched by Subversion. Dreamweaver however has decided in its synchronisation process to check to see if each of these files are on the remote server. Of course they are not – nor ever should be. Dreamweaver has then listed them for deletion! 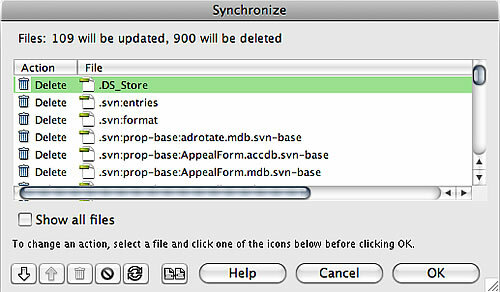 Important: DO NOT ALLOW ANY OF THESE FILES TO BE DELETED as part of this sync-down. Doing so will break your working copy and break your local site’s sync with the repository. Clearly from the above Dreamweaver has not only given me a huge list to work through, but in doing so has wasted a whole load of time – the FTP commands for checking 900 files are quite time consuming. I’m not sure why Dreamweaver is including .svn files in this particular synchronisation effort. I can think of no use-case where this would be desired. Dreamweaver is smart enough not to attempt to sync .svn files when updating to the remote server rather than from the remote server.Therefore I suspect this is an over-sight, and I have logged it as a bug via the Adobe Bug Report Form. Deleted site files, either deleted via a sync operation or direct deletion in the Files window, do not get committed to the repository on your next ‘check-in’. In fact so far I have not seen any way for Dreamweaver to inform the repository of deletions and I am currently relying on 3rd party tools to undertake the commit. In my case I use SCPlugin and commit the site folder, at which point it will list the deleted files as ‘missing’. Selecting those and hitting commit records them as deleted to the repository. Maybe I’m missing something as this seems a major omission of basic functionality. It is quite dangerous for deletions not to get properly recorded to the repository, running the risk that the deleted files may be inadvertently restored to the local copy and eventually to the live site. Having found the documentation, it is clear that Dreamweaver’s subversion integration really does not extend to committing deletions to the repository. They need to be done either manually or through a 3rd party tool as I describe above. Pretty unfriendly for anyone new to subversion and quite different from the workflows used within dreamweavers for sunchronistion between local and remote sites for instance. Personally I think the documentation should explain this fact much far prominently as well as describing in more detail how manage deletion and renaming if connected to subversion. 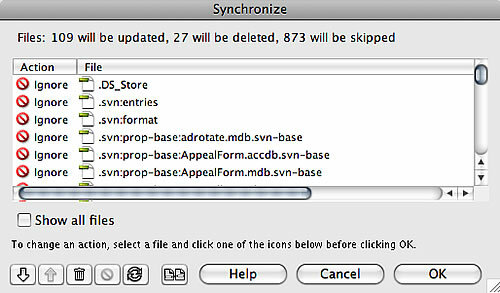 Posted in Adobe, CS4, DreamWeaver, subversion 6 Comments on Dreamweaver CS4, Subversion and site Synchronize. Two cautions. I’ve been using subversion for a few years now. Initially used through subclipse within Eclipse/Flex Builder then later also used with Dreamweaver sites using tools such as svnX and scplugin along with the “Cloak SCM directories” command. In most cases to date, I have used the “file:///” protocol as this provides direct and efficient access to repositories which are available within the local system or local area network. I had been looking forward to subversion integration in Dreamweaver and when the CS4 public beta was released I had a bit of a moan about the absence of the file protocol. Despite my efforts in the beta’s forum and the Dreamweaver wish-list, it remains absent. So now to look to using a different protocol. svn served using mod_dav_svn through Apache over http is less efficient than svnserve through ssh. I have multiple repositories, one per project and all stored on a separate project disc. To use the http method, I would need to edit httpd.conf to add a directory mapping and manage access rights for each repository. By using svn+ssh, svnserve launches on demand (no need for a running daemon) and we have access to all the paths available to the ssh user logged in. Turn on ‘Remote Login’ in the ‘Sharing’ system preferences. Rather than using the default of allowing access for all users, I restricted access to only my user. At this point you should be able to use sv+ssh urls from within terminal. e.g. If the .ssh directory doesn’t exist, then use mkdir to create it. ssh-keygen creates both public and private keys. As this is my one and only public key, I simply uses the following line to copy the public key to a file called ‘authorized_keys’. However if you are dealing with more than one key, you should use the guaidance in the OpenSSH article to append the key to that file. Once this has been done, attempting to use your svn+ssh url within svnX should now work. Note: you may get the error re-displayed, but it will dismiss to be replaced by a current view of the repository. Also the first time, you will be prompted for the password. Here you need to enter the passphrase you used when you created the rsa key. I chose for this to be remembered in my keychain to avoid having to retype it in future. In Dreamweaver create a new site and manage the settings accordingly, pointing the local site to the folder you just created. The latest versions of the files in the repository will be checked out of the repository into your local folder which will now become a working copy. what the feck is AOO TLP ? Having been chastised for using these ‘unknown acronyms’ in my comment on jd’s weblog, I thought it worth writing a brief entry describing what these acronyms stand for and how they may be of interest for those purchasing or upgrading Adobe software. Essentially this is all to do with volume licensing as an alternative to purchasing products through the Adobe store or other 3rd party suppliers. Volume licensing sounds like it is aimed at large organisations purchasing site-license. However the Transaction Licensing Programme facilitates as little as a single product license. The way the scheme works is to provide a transaction discount should you purchase multiple products in a single transaction based upon a point value for each product. TLP purchases may be made through 3rd party suppliers, but also through Adobe directly as in my case. There is no published price list so you need to request a quote. The key point of interest to me was the Upgrade Plan which allows licenses to be purchased over 24 month subscriptions. Essentially this means I effectively have already paid to cover my CS4 upgrade. This is the point I was trying to make on jd’s weblog. He acknowledges that trial versions of CS3 products not being available until mid November is a ‘Pain point’ and he provides some explanation including the phrase “The big shipping versions get released first.”. Well I’m a AOO TLP upgrade licensee who’s just been told I may have to wait until the ‘end of November’ for it to physically ship to me. If it is painful for ‘users’ who haven’t paid for the software yet, imagine the pain for those who have paid for the software, but may have to wait until the end of November. So while the Upgrade Plan offers some value, fulfilment seems less than ideal especially given this Key benefit documented on the Adobe site: “Get timely notifications of new upgrades, so you can stay on top of new product releases.”. This is now my latest bug-bear. For Adobe to see how the customer experience could be improved in this regard, they need only look back to the now discontinued Macromedia DEVNET Pro subscription, where serial numbers and downloadable installers were immediately available to subscribers from day one of a new product shipping. If this was fixed, I could now be blogging about cool new stuff in CS4 rather than fuming over this and wondering if I would actually be better-off purchasing through conventional means. Received my Adobe License Fulfilment email on 26th. Logged in and was able to request media for the upgrades, but at the time couldn’t see serial numbers or any way of downloading. However just checked again today, and the serials are there and I now have downloads in progress – and at a good bit-rate. So I’m feeling a lot happier now than when this post was originally published. While the process has not been entirely seamless, this time is far better than my previous experience with CS3 where I had to wait for physical media. Posted in Adobe, CS3, CS4, DreamWeaver, Fireworks, Flash, Flex, Flex 2, Flex 3, Flex Builder, License comment on what the feck is AOO TLP ?